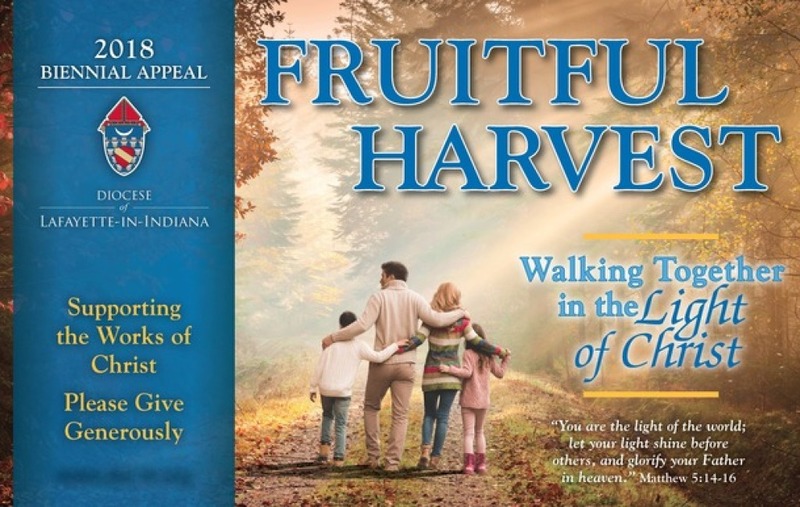 The Fruitful Harvest campaign is our biennial stewardship fundraiser for the Diocese of Lafayette-in-Indiana. With approximately 35,000 Catholic families in 62 parishes across the Diocese, there are many ministries that the Diocese can offer that we as a single parish cannot. Catechetical training for Religious Education teachers, recruitment and training of priests, medical care for retired priests, evangelization...these are just a few of the many services we receive from the Diocese of Lafayette-in-Indiana. The Fruitful Harvest Diocesan Appeal is an opportunity to respond to His grace by sharing our treasure to help our neighbors throughout the Diocese. Our parish's goal for Fruitful Harvest 2018 is $223,538 with 100% participation from parish families. The Diocesan goal for Fruitful Harvest 2018 is $9.2 million. Each parish has been assigned a share of that goal based on a formula, which takes into account both the parish population and offertory income. EVERY gift, regardless of size, is vital to our success. As soon as a parish reaches its assigned goal in paid pledges, a 10 percent rebate is paid. In addition, most parishes receive 50 percent of all funds received in excess of their goal. Click here to read the full letter from Most Reverend Timothy L. Doherty to the Lafayette diocese.